I have to point out the last two times I wore this dress. When I saw it on Twice* I was won over by the color (and the stripes, it's always about the stripes). But when it got to me, it was at least a size too big. Earlier this summer I tackled taking it in and what a difference! I can't believe what a couple inches does to a dress! I tried to hide it before alterations by layering and belting it, but I am much happier with how it looks now. Check out how I've worn it 'before' here and here! Passion for Fashion @ Lena B Actually and Rachel the Hat, Friday's Fab Favorites, Favorite Fashion Friday, Fashion Item Friday *Sign up using this link and get $10 off your first purchase! I will get a $10 credit if you make a purchase. Such a cute stripe dress, love the colors. Love this striped dress-looks great on you!! A great classic with fun bright colours! This dress looks great on you! Great job on alterations! You are so good with alterations! Looks great on you! That dress is so pretty on you! Love it! You look fantastic and yes it's the stripes. Such a happy colors. Love the colors of this dress! Great job on the alterations! It looks perfect on you! The colors in the dress are so pretty - totally worth the alterations, which are flawless! i need this dress! you did a great job altering it. Could have fooled me in that this was the first time wearing this awesome striped dress. You are so cute that I think everything looks great on you. But your creativity needs to be commended too. Thanks for the cheers! I fixed the pics on my post now so at your convenience, please go see them again, yes? 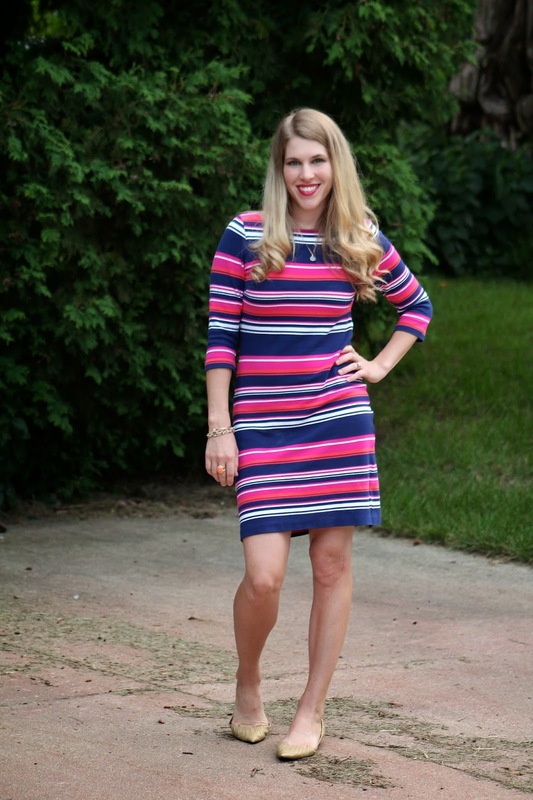 The stripes and colors make this dress super adorable! And way to go with your seamstress skills :) I tend to shy away from things that need alterations because I can't sew myself and I always put off going to the tailor. I love this dress! It's perfect now that you have taken it in a bit! love the ways you have style this dress. Have a great weekend. You look fantastic in all those jewel colours! Love the lip colour too. 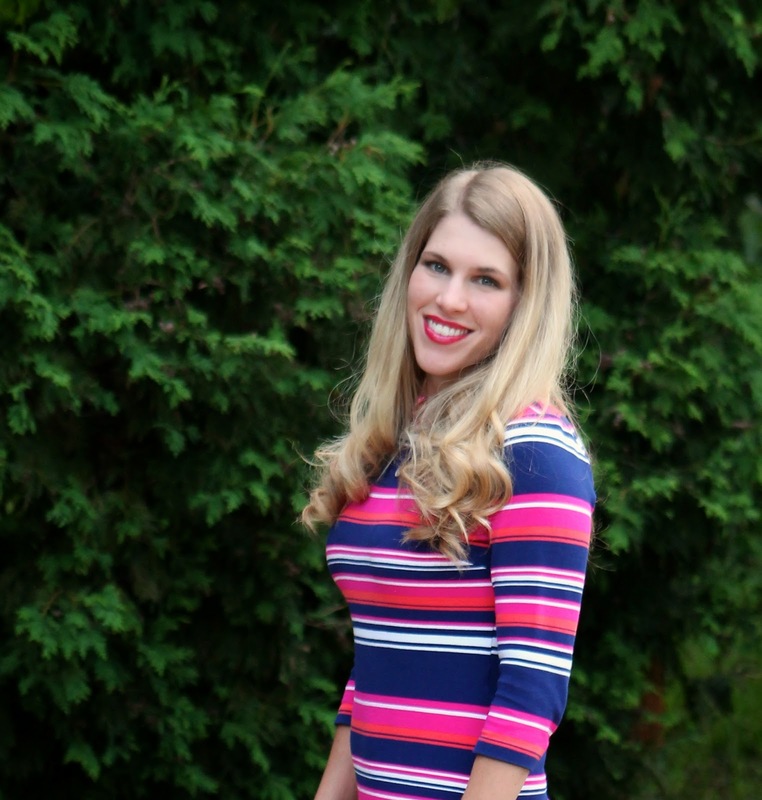 I'm wearing a striped dress in this week's Passion For Fashion! Great minds think alike! Love the colors and props for taking the initiative to take it in... I would have just re-sold it! ;) Thanks for linking up! What a cute dress! So glad that the alteration made it more useful for you--it is quite annoying to have to wear a piece a certain way due to bad fit. I put off going to the tailor and that's exactly why I taught myself to do simple alterations! Except now I sometimes put off doing alterations! haha! Such a great dress and it really looks so nice that it fits you well! Love the colors.